Lineage. Organized as 102nd Aero Squadron on 23 Aug 1917. Demobalized on 1 May 1917. Reconstituted and consolidated (1936) with 102nd Squadron which, having been allotted to NG was organized on 17 Nov 1921. 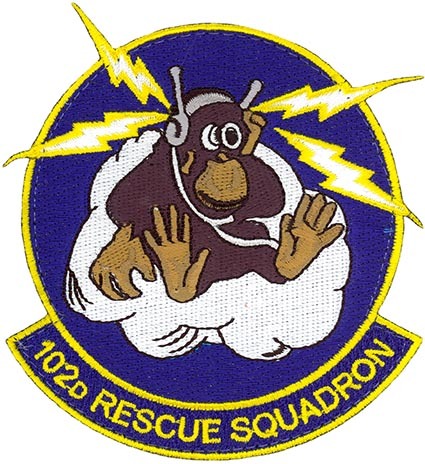 Redesignated 102nd Observation Squadron on 25 Jan 1923; Ordered to active service on 14 Oct 1940. Redesignated 102nd Observation Squadron (Light) on 13 Jan 1942; 102nd Observation Squadron on 4 Jul 1942; 102nd Reconnaissance Squadron (Bombardment) on 2 Apr 1943; 102nd Tactical Reconnaissance Squadron on 11 Aug 1943; Disbanded 15 Apr 1944. Reconstituted 102nd Bombardment Squadron (Light) and allocated to ANG on 24 May 1946. Extended federal recognition on 30 Nov 1947. Redesignated: 102nd Bombardment Squadron (Medium) in May 1951; 102nd Bombardment Squadron (Light) on 1 Dec 1952; 102nd Fighter Interceptor Squadron on 15 Jun 1957; 102nd Aeromedical Transport Squadron in Sep 1958; 102nd Air Transport Squadron (Heavy) on 1 Jan 1963; 102nd Military Airlift Squadron on 1 Jan 1966; 102nd Air Refueling Squadron on 17 Sep 1969; 102nd Fighter Interceptor Squadron on 2 Dec 1972; 102nd Aerospace Rescue & Recovery Squadron, 14 Jun 1975; 102nd Air Rescue Squadron on 1 Oct 1989; 102nd Rescue Squadron, 16 Mar 1992-. Assignments. Unkn, 23 Aug 1917-Mar 1918; Second Aviation Instruction Center, Mar 1918-Mar 1919; Unkn, Mar-1 May 1919; NY NG (divisional aviation, 27 Division), 17 Nov 1921; Second Corps, c. Nov 1940; II Air Support Command, 1 Sep 1941; 71st Observation Group, 1 Oct 1941 (attached to 69th Observation Group from Dec 1941)’ 69th Observation (later Reconnaissance; Tactical Reconnaissance) Group 5-15 Apr 1944. NY ANG 30 Nov 1947; 106th Bomb Group (Light), 1 Mar 1951; 106th Bomb Group (Medium) 16 Jun 1951; 106th Fighter Interceptor Group, 15 Jun 1957; 106th Air Transport Group, Sep 1958; 106th Air Refueling Group, 17 Sep 1969; 106th Fighter Interceptor Group, 2 Dec 1972; 106th Aerospace Rescue and Recovery Group, 14 Jun 1975; 106th Rescue Group, 1 Oct 1989; 106th Rescue Wing, 16 Mar 1992-. Aircraft. JN-4, TW-3, PT-1, BT-1, O-11, O-17, 1922-1933; O-38, c. 1932-c. 1937; O-46, 1936-c. 1943; O-47, c. 1939-1943; O-49, 1941-1943; O-52, 1942-c. 1943; O-57, 1941; L-4, 1942-1943; P-39, 1943-1944; A-20, B-25, L-5, P-40, 1943-1944; B-26B/C 1947-1951; B-29, 1951-1952; B-26, 1952-1957; F-94B, 1957-1958; C/MC-119J, 1958-1962; C-97A, 1962-1969; KC-97L, 1969-1972; F-102A, 1972-1975; HH-3E, 1975-1990; HC-130P, 1975-Present; HC-130N, 1988-Present; HH-60G, 1990-Present. Operations. Primarily transportation and aircraft repair and maintenance 1918-1919. Emergency operations while under state control included flood relief in Vermont, 6-16 Nov 1917 and in New York, 11-13 Jul 1935. Antisubmarine patrols, c. 1941-c, Oct 1942; aerial support for ground forces in training, 1942-1944. Called to active duty as part of the Korean War call-up, 1 Feb 1951-Dec 1952. Provided end of runway air defense alert. Transport of wounded and injured, airlifted critically injured and sick personnel until 1964. Flew scheduled MATS transport missions to Europe, Africa the Caribbean and South America. Provided air refueling. Combat search and rescue, 1975-. Emblem. Approved on 28 Apr 1960.